New KTM Duke 125 is undoubtedly the smartest looking machine in its segment. You can notice the styling cues from the bigger Duke 390 while features like a full-LED headlight and the new TFT console makes it better than any bike around the competition. The 124.7cc, single cylinder, liquid cooled and fuel injected engine on the motorcycle is good for 11.75 BHP @ 9500 rpm and 11.80 Nm @ 8000 rpm. The powerful motorcycle claims a top speed of around 120 kmph. Internationally, it can be bought in Orange/White and Black/White livery. That makes it exactly the same as the bigger Duke 390. Replace the engine and differences are hard to find. KTM even offers 2-channel BOSCH 9.1MB ABS on the baby Duke 125. As per the latest details available, the bookings for the 125cc Duke are now open in India. The bike is expected to launch in India within next 30-40 days. 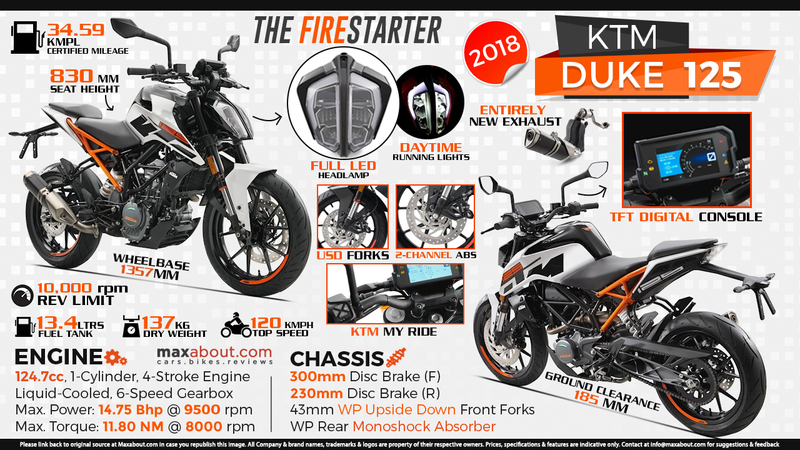 Click here to know more about 2018 KTM Duke 125.